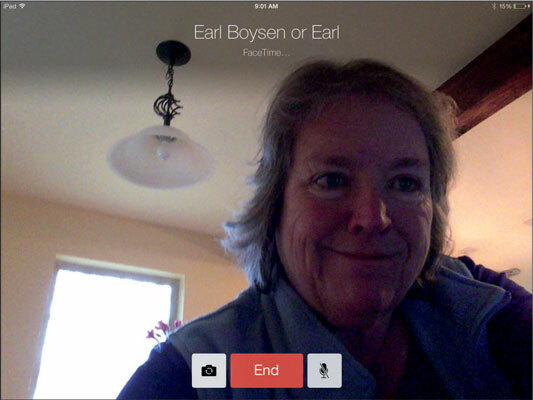 You can make and receive calls with FaceTime using a phone number (iPhone 4/4s/5/5s/5c) or an e-mail account (iPad 2 or later, iPod touch fourth-generation or later, or a Mac running OS X 10.6.6 or later) and show the person on the other end what’s going on around you. If you have a Wi-Fi–only iPad and use FaceTime over a Wi-Fi network, that limits the places from which you can make or receive video calls to your home wireless network or a public hotspot. On the other hand, you avoid costly data usage over a 3G or 4G network with this setup even if you own a 3G/4G iPad model. You have to use the appropriate method for placing a FaceTime call, depending on the kind of device the person you’re calling has. If you’re calling an iPhone 4 or later user, use a phone number the first time you call, and thereafter, you can use the phone number or e-mail address; if you’re calling an iPad 2 or later, an iPod touch, or a FaceTime for Mac user, you have to make the call using that person’s e-mail address. You can’t adjust audio volume from within the app or record a video call. Nevertheless, on the positive side, though its features are limited, this app is very straightforward to use. Connect to a Wi-Fi or cellular (with iOS 6 or later) network. You may already have set up this type of network in your own home using your computer and some equipment from your Internet provider. You can also connect through public Wi-Fi networks (hotspots). 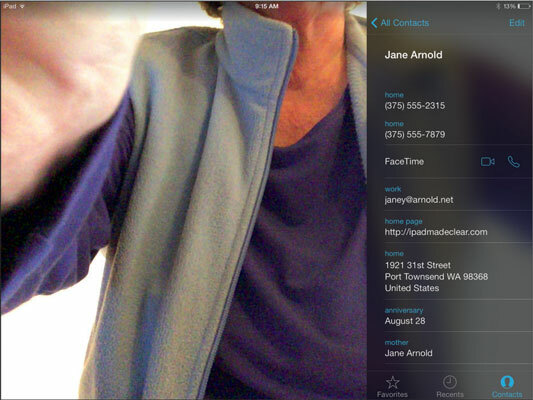 If you know that the person you’re calling has FaceTime on an iPhone 4 or later, an iPad 2 or later, or a Mac, add the person to your iPad Contacts. You will need to add the person if he/she isn’t already in Contacts. Tap the FaceTime app icon on the Home screen. The first time you use the app, you may be asked to select the phone number and e-mail account you want to use for FaceTime calls and then to click Next. The FaceTime screen appears. Tap the Contacts button in the bottom-right corner of the screen. Scroll to locate and tap a contact’s name. The contact’s information displays (as shown). You can also place a FaceTime call using Siri. Just say something like “Make a FaceTime call to Joey” and confirm Joey’s contact information, and the call is placed. Tap the contact’s stored phone number or e-mail address and then tap the Call button (shaped like a phone handset). You’ve just placed a FaceTime call! When you call somebody using an e-mail address, the person must be signed in to his Apple ID account and have verified that the address can be used for FaceTime calls. iPad 2 or later and iPod touch (fourth-generation and later) users can make this setting by tapping Settings and then FaceTime; FaceTime for Mac users make this setting by choosing FaceTime___Preferences. When the person accepts the call, you see the person’s image and a small, draggable box containing your image (referred to as a Picture in Picture, or PiP). 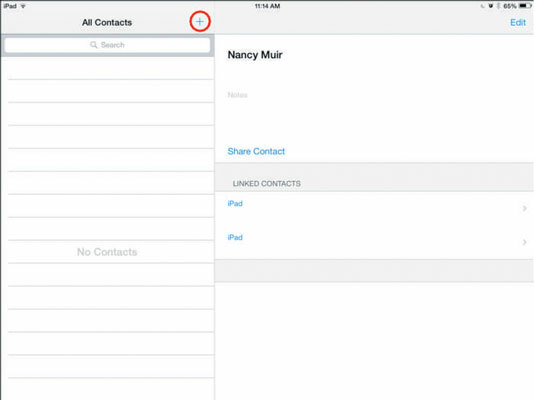 You can also simply go to the Contacts app, find a contact, tap the FaceTime icon in that person’s record, and then tap her phone number or e-mail address in the pop-up menu that appears to make a FaceTime call. A FaceTime call in progress. To view recent calls, tap the Recents button (refer to Step 4). Tap a recent call to call the person back.